I´m in a bit of a hurry right now, so please excuse such a small blog post. What's the hurry? P.S. FIRST! Wait, MediaFire removed your content due to probably using Nintendo sprites, and yet Nintendo has done nothing against the actual project? Wow, Nintendo Better not shut your project down! BTW, why are you in a hurry? Sorry, I had to leave, and I wanted to fix the download links ASAP. I´ll be posting properly soon. That's good to hear! Always like hearing updates on the project. I really hope this "Metroid Confrontation. Isn't the actual deal here. I don't remember fighting Kraid, Ridley, hell even Crocomire for that sake in the original. Is this a side game you are working on? And if it is where is the link for the actual one. I didn't see one Metroid in the game at all. :( makes me sad. I know that scripting from srcatch and all that is time consuming. (I haven't done it but still that is an easy assumption.) But I was wondering if you have an ETA for the game. Confrontation is a sort of side project that mainly exists to whet our appetites and show off the engine of the game. Right now it remain a techdemo (clarifying, not a piece of the finished project but it's own self contained minigame built with the same blocks as AM2R will)but will eventually maybe grow into it's own full length game. I recently played M:C to give it a looksee, and decided to make a video regarding my opinions and thoughts on how you might improve the Kraid battle. So I finally got around to trying out v2.15. Unfortunately, neither of my Logitech Rumblepad 2's is being recognized in setup, nor is my Belkin Nostromo n52. I've got the latest drivers for both types of controller, and both the drivers and other games recognize the gamepads. Are only PS and X-Box controllers supported at this time, or is there something else that needs to be configured? Nintendo Maniac 64 our face so this taking too long. is just making excuses to not finish the game soon. aff so this guy is getting very suspicious. this game comes out or not. Q te calienta lo q tarde o no flaco? el tipo lo hace gratis, algun dia saldra, o no, y si no sale no es la muerte de nadie. PD: o tu ingles es muy malo o el poco ingles q se es peor de lo q yo creia. 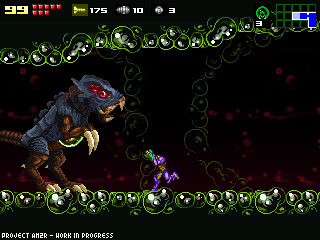 The bats only attack when you are right below them, whereas in Super Metroid, they see Samus from a slight distance. Just a thought. jaja Juan se lanzo con todo! Ok, if you think it's really that easy to make a game, why don't you make one yourself. The doc has a life, you know, and even still he's putting all his free time into this. You call it "excuses", I call it "life". Just get over it; the game will come out when it's done. My apologies if this comes across as pushy, but what happened to "I´ll be posting properly soon."? It's cool if you've been too busy to work on the project, it's just that you've been sparse on the blog posts for awhile now, and seeing you say that you're going to post again so soon after the latest post had me a little excited. Take your time, don't listen to the people that want you to release it as soon as posible. This is by far the best fan game I've ever seen. Good luck! Actually he should listen to the people who want it released, just not too much. People who want it out = people who want to play it. People wanting to play it = motivation to finish the project. This blog has shown that the Doc is very nearly done actually, just needs some programming done for the endgame and various odds and ends. A little patience will pay off for this project, but reminding the Doc that he has a large world-wide audience awaiting his work would motivate him to finish it. I check this blog everyday hoping for good news, and I do this because the trailers and Confrontation has shown this to be one of the greatest fan games of all time. I'd hate to rush him or sound pushy too, but I also realize that these pushes are what reminds a programmer that there is reason to make it to the goal. the game isn't working on my computer, it looks very promising. Good luck on AM2R. After you finish the game would be interesting to also launch the engine not the source code of the game, so fans could make your own game Metroid.